You may know someone whose basement is full of trains, or at least someone who has a few items of train paraphernalia around the house. But the ultimate prize for any train lover is an actual train. This spring the Illinois Railway Museum in Union, McHenry County, Illinois is making that a real possibility. The museum is making one of the railway cars in its collection available to a good home. The railway car in question won’t fit in your basement – in fact, it may not even fit in your driveway. It is a wooden baggage car from the Chicago & North Western Railway numbered 1236. It was built in Chicago by the Pullman Company in 1908 and is roughly 70’ long, weighing in at about 99,000 lbs. The historic car, which is built mostly of wood, was once used on Chicago & North Western passenger trains to carry passengers’ luggage and small express freight shipments. It was acquired by IRM in 1964 and for a time was used to store spare parts for other trains at the museum. More recently it was employed as a storeroom for the museum’s gift shop. The railway car is mechanically complete but the interior is partly removed – perfect for someone looking to create a unique shop, club room, or getaway. 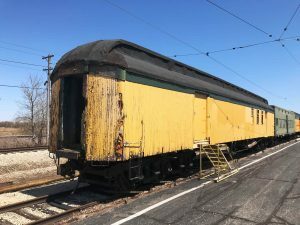 Another identical baggage car owned by the museum is being retained and is currently on public display as an historic artifact. “This car may be surplus to our needs, but it has stuck around for 110 years so far and we are hoping that someone can provide it a good future so that it’s still around in another century,” stated Paul Cronin, IRM General Manager for Collections. Baggage car number 1236 is being offered as-is, where-is at the museum’s property. Serious inquiries can be directed to Paul Cronin, IRM General Manager, and the baggage car is available for inspection to any museum visitor. IRM is open daily until September 16th and weekends through the end of October.